These giant black holes are over a million times more massive than the sun and sit in the centre of galaxies sending out powerful winds that quench the star-making process. Supermassive black holes can regulate their host galaxy's ability to form new stars. 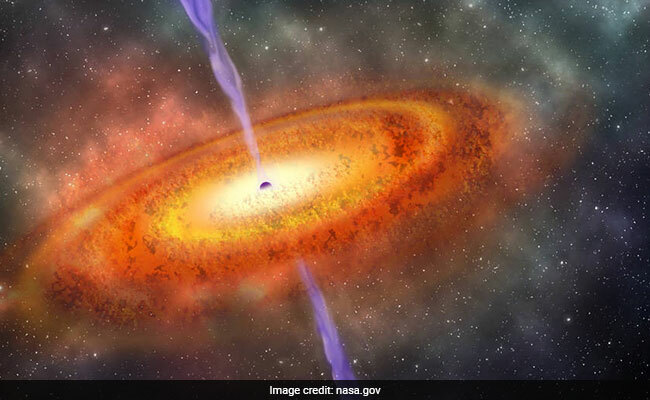 London: Scientists have found evidence that supermassive black holes prevent formation of stars in some smaller galaxies, in what they believe decodes a cosmic mystery. Astronomers previously thought black holes had no influence on the formation of stars in dwarf galaxies but the new study from the University of Portsmouth in Britain has proved their role in the process. The results show that dwarf galaxies -- those composed of up to 100 million to several billion stars -- are far more numerous than bigger systems and what happens in these is likely to give a more typical picture of the evolution of galaxies. "Dwarf galaxies outnumber larger galaxies like the Milky Way 50 to one," says lead researcher Samantha Penny, from the varsity's Institute of Cosmology and Gravitation. In any galaxy, stars are born when clouds of gas collapse under the force of their own gravity. But sometimes supermassive black hole shuts off star formation in a galaxy. Supermassive black holes can regulate their host galaxy's ability to form new stars through a heating process. The black hole drives energy through powerful winds. When this wind hits the giant molecular clouds in which stars would form, it heats the gas, preventing its collapse into new stars. The dwarf galaxies under observation were still accumulating gas which should re-start star formation in a red, dead galaxy but wasn't. This led the team to the supermassive black hole discovery. "Our results are important for astronomy because they potentially impact how we understand galaxy evolution. Supermassive black holes weren't thought to influence dwarf systems but we've shown that isn't the case," Penny said. The findings were presented at the 229th Meeting of the American Astronomical Society in Texas.